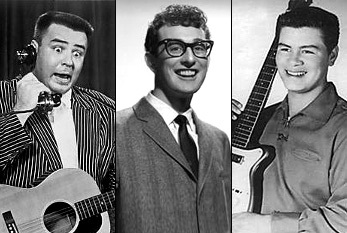 On this bleak day in 1950, three rising US Rock ‘n’ Roll stars were killed. Buddy Holly, J.P. The Big Bopper Richardson, and Ritchie Valens all died when a Beechcraft Bonanza plane they had chartered crashed in Iowa. The tragedy took place mere minutes after the plane took off in Mason City, taking the musicians through to Moorhead, in Minnesota. With music from this group of musicians even appearing in the online pokies Australia makes available, with The Big Bopper being a widely enjoyed title, Don McLean’s American Pie put the iconic line, The day the music died, into our lexicon. A Mixture of Chance and Fate? After having to deal with mechanical difficulties with their tour bus, Holly had seen fit to charter a plane for his band to fly to each of the stops on their Winter Dance Party tour. However, The Big Bopper was sick with flu, and managed to convince band members, Waylon Jennings, to give up his seat. Jennings went on to become a country music superstar, of course, and no doubt has mixed feelings about the reasons he was able to! Ritchie Valens then won a coin toss, and took a seat on the plane as well, sparing Holly’s guitarist, Tommy Allsup. Charles Holley, who would go on to find fame as Buddy Holly at just 22-years old, was born in Lubbock Texas. He started singing Country music with a couple of friends from high school before he made the switch to Rock ‘n’ Roll. By the mid-1950s he and his band had major hits like Peggy Sue, and Holley wrote all the material, much of which was only released after he had passed away. Legends like Bob Dylan have stated being heavily influenced by him. The Big Bopper was 28-years old, and has started out as a Texas disc jockey before he started songwriting. His most famous recording was Chantilly Lace, a Rockabilly track which broke into the Top 10. Mr Richard Valenzuela, aka Ritchie Valens, hailed from Los Angeles, and was the youngest of the trio at only 17-years old when the crash occurred. His hits include La Bamba and Donna, and he was posthumously inducted into the Rock and Roll Hall of Fame more than 40 years after his death, in 2001. In 2015, Don McLean finally opened up about what many see as one of the most mysterious songs in the history of Pop, his 1971 hit, American Pie. To this day, the song is played everywhere, from weddings to festivals and eveything in between. In the notes accompanying the original manuscript of the song that fetched US$1.2 million at an auction in 2015, he describes it as a morality song. The acclaimed singer-songwriter stated that the tune was about American heading in the wrong direction, according to an interview published in the auction catalogue. McLean said that things were becoming less than idyllic, and, whether this was considered to be wrong or right, it made the track a morality song, in his opinion.